Sialkot boasts as a great centre of Punjabi culture. In the old part of the city is located the shrine of Hazrat Imam Ali-ul-Haq also known as Imam Sahib. The mausoleum complex is a maze of narrow corridors leading to several shrines of saints. The tomb of Imam Ali-ul-Haq is to the right, through a mirrored gateway tiled with Qoranic inscriptions and geometric designs. Sialkot boasts as a great centre of Punjabi culture. In the old part of the city is located the shrine of Hazrat Imam Ali-ul-Haq also known as Imam Sahib. The mausoleum complex is a maze of narrow corridors leading to several shrines of saints. The tomb of Imam Ali-ul-Haq is to the right, through a mirrored gateway tiled with Qoranic inscriptions and geometric designs. On a low hill in the centre of the old city are the few remains of the Sialkot Fort. It is one of the oldest forts in Pakistan established around the 2nd century AD. The shrine of the saint Muradia Shah is also on the Fort. PuranPuran's Well is a famous historical site, which is related with Punjabi folklore 'BhagatPuran'. It is located just outside the city of Sialkot. Also of interest is the birth place of Dr. Muhammad Iqbal (1877–1938) which has been turned into a small museum containing some of his personal belongings and a library and named as IqbalManzil (Iqbal House). The most famous square of the city is AllamaIqbalChowk. Near the AllamaIqbalChowk is located the biggest grand mosque of the city, Jamia Masjid Donga Bagh. One of its three minarets is the tallest landmark in Sialkot. Other places of interest include the tombs of the great Muslim scholars, Mullah Abdul Hakim Sialkoti near Abdul Hakim Park. Seerat Study Center is situated at the southern edge of the Khayaban-I-Iqbal. It is a world-renowned center for conducting research on the life of the Prophet Muhammad. Located in the cantonment area is the famous Holy Trinity Cathedral Church also known as the Sialkot Cathedral which was built in 1852. Every year, many Sikh pilgrims come to visit here. 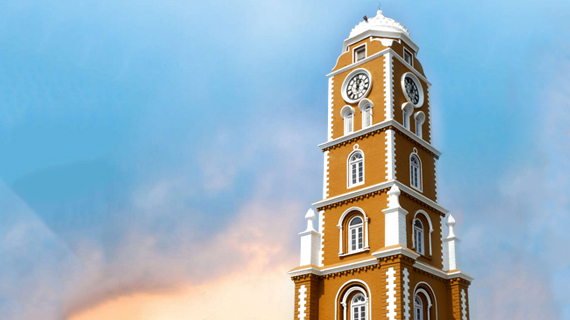 In Saddar Bazar is located the famous Clock Tower which is more than a century old. The Connelley Park was converted to Jinnah Stadium in 1979. The Jinnah Stadium has one of the fastest cricket pitches in Pakistan. Close to Jinnah Stadium is located the famous Murray College which was established in 1889. Sialkot has three main parks, Khayaban-e-Iqbal Park, Gulshan-i-Iqbal Park and Garrison Park on Kashmir Road. Some of the other famous and historic places are the TalabMaulaBakhush and Ram Talai. TalabMaulaBakhush is the place where, in May 1944, the historic Sialkot Convention was held. It was also attended by Muhammad Ali Jinnah and Liaquat Ali Khan. Both sites have been converted to mini stadiums for traditional wrestling (Kabadi) and volleyball matches and also for political rallies. There are several famous squares in the city as BeriWalaChowk, Rang PuraChowk, Dara-Araian, Imam Sahib Chowk, ShahabPuraChowk, Sublime Chowk (MalkayKalan), HansaChowk and Anwar KhawajaChowk. Famous markets (bazaars) are Bazar Kalan, Trunk Bazar, Tehsil Bazar, Lahai Bazar and Saddar Bazar. MaralaHeadworks is located on the Chenab River about 20 km from Sialkot. Two major water canals originate at the MaralaHeadworks - the Marala-Ravi Link Canal and the Upper Chenab Canal. The area around the MaralaHeadworks Lake is also a picnic spot. The Bajwat Wildlife Sanctuary includes a complex of natural riverine habitats along the Chenab River and two of its tributaries, extending up to the border with India with a total area of 5400 hectares providing protection to waterfowl, as well as a variety of mammals including Hog Deer and Nilgai.